Platooning trucks and their drivers rely on communications between vehicles and with the Peloton Network Operations Cloud (NOC). That’s a simple enough concept. But in reality, even the most fundamental communications activities can potentially use a bewildering array of devices and protocols, including GPS, Wi-Fi, Bluetooth, cellular, and even wired protocols such as Ethernet. Earlier, we described some benefits of our direct vehicle-to-vehicle (V2V) communication, a proprietary implementation of the industry-standard dedicated short-range communication (DSRC) protocol that’s similar to Wi-Fi. V2V communications enable platooning trucks to accelerate and brake together as a single, unified system. It plays an important role in safety and driver teamwork. But the underlying DSRC protocol has a range of only about a mile. How, then, do the platooning trucks stay in contact with the Peloton cloud, which is necessary for platooning to take place? The NOC authorizes a pair of trucks to form a platoon, then supervises and coordinates the platooning process. The Peloton cloud also provides data analytics to help fleet managers document, monitor, and improve their platooning operations. To enable this functionality when the trucks are beyond the range of DSRC, we use LTE. Long Term Evolution technology, better known as LTE, might, in theory, be up to 10 times faster than the previous 3G technology, although actual network speed varies depending on network load and signal strength. Still, LTE is a fast, long-range communications technology. The Peloton platooning system includes an LTE modem built into every truck. LTE is what allows the trucks to stay in communication with the Peloton Network Operations Cloud at all times. Push-to-talk audio allows drivers to rendezvous in order to form a platoon. While a pair of trucks is platooning, the Peloton NOC uses LTE to advise drivers about road and weather conditions ahead and to provide fleet managers with status updates on their platooning trucks. LTE communications provide drivers with information important for their continued safety. For instance, drivers can be alerted to an upcoming traffic jam or a heavy rainstorm—conditions unsafe for platooning—in time for them to dissolve the platoon in an orderly fashion. Safety is Peloton’s top priority. Peloton platooning includes a ‘deadman switch’ approach, in which the system can’t operate unless the communications ‘switch’ is periodically closed between trucks and the Peloton cloud. A simple example of this deadman switch approach is a treadmill that operates only if you’re pushing a button; if your hand falls away from the button, the treadmill stops. Similarly, Peloton platooning happens only if a ‘permitted to platoon’ message sent from the NOC is received via LTE by the trucks. If the message doesn’t go through, the trucks automatically separate, and platooning stops. 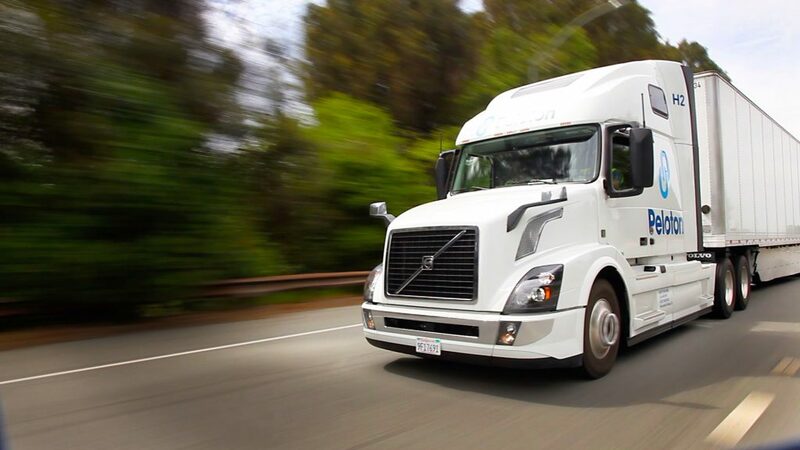 While the DSRC communication is real-time safety critical, and thus if it is disconnected the trucks immediately separate, the cellular connection needs to be available periodically with short outages easily tolerated. While platooning is taking place, fleet managers receive data over LTE that lets them know in real time what their trucks are doing, where they are, and if the platooning system is operating properly. After a platooning session finishes, log data on the storage drive of the platooning control unit in the trucks is sent via LTE to the trucks’ fleet managers. This data provides insight into the operation of the vehicles while platooning, including, for example, truck battery voltage and fuel usage. Truck technicians can also use LTE to log into the truck’s log data remotely to when maintenance is required. Peloton has also developed over the air update capability and is working with each commercial partner to ensure that this is used in a fully secure manner. No single communications protocol is sufficient on its own for effective and safe truck platooning. Different ranges, coverage, and other factors require a mixture of technologies. Cellular technology, specifically in the form of LTE, is a crucial piece of the complete Peloton platooning picture. 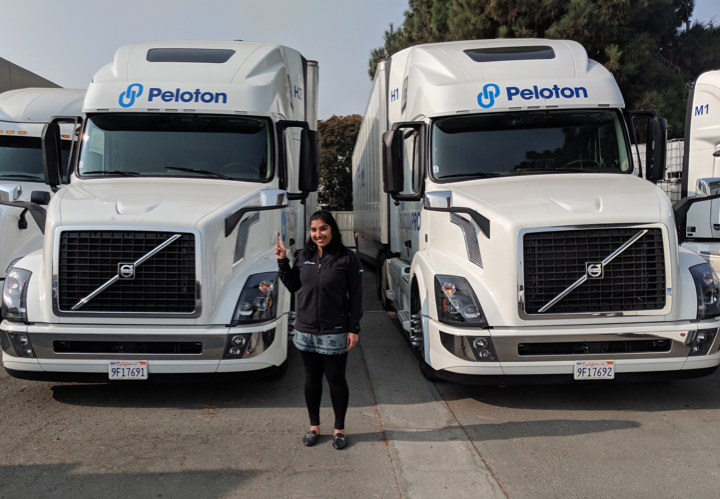 The LTE modems installed in Peloton trucks, and used by the Peloton Network Operations Cloud, contribute significantly to driver safety and to the management of platooning benefits by fleet managers. Visit our website to learn more about how communications and platooning work together.